The Italian Market, located in the Bella Vista neighborhood of South Philadelphia, is the popular name for the food shops and curbside stands on Ninth Street between Fitzwater and Wharton Streets, where merchants sell fresh produce, prepared foods, imported products, goods, and equipment for both household and commercial consumption. The majority of food establishments specialize in the sale of fruits and vegetables, cheese, meat, poultry, seafood, pasta, spices, and baked goods. Complementing the array of shops are restaurants, delicatessens, and cafes that offer dining and refreshment. 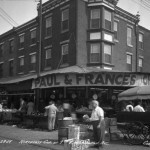 The market evolved as the principal food shopping hub for the Italian immigrants who began to settle South Philadelphia in large numbers at the end of the nineteenth century. Existing row houses on Ninth Street, formerly occupied by Irish, German, and Jewish residents, provided building stock of contiguous structures that were easily modified for family businesses, with stores at ground level and living spaces for relatives and boarders on the upper floors. Ninth Street grew rapidly as the commercial catalyst for the Italian community, as waves of new immigrants in the early twentieth century found the neighborhood to be a familiar cultural, architectural, and linguistic setting in which to live, earn a living, and shop. The commercial character of Ninth Street was secured in 1915, when the community’s leading businessmen (second-generation Italian Americans with ancestral roots in central and southern Italy and eastern Sicily) formed the South Ninth Street Business Men’s Association, whose mission was to promote commercial development on Ninth Street between Catharine and Federal Streets. The association received the privilege of incorporation from the Commonwealth of Pennsylvania in exchange for ensuring cleanliness, illumination, paving, and police protection within the boundaries specified in its charter. Ninth Street became an official curb market, sanctioned by state and local government at a time when fear of food shortages and the high cost of living stimulated their popularity nationwide. Curb markets were characterized by vendors selling from pushcarts, wagons, trucks, or sidewalk stands arranged in a linear fashion along a designated street. They offered an immediate and economical outlet for food products and related merchandise, without the need for specialized market buildings or intermediaries in the distribution process. Formal establishment of the Ninth Street curb market was timely and progressive, for it secured a year-round market for fresh produce, imported goods, quick meals, restaurant supplies, processed foods, and household goods, all within close proximity to purveyors and customers. Businesses in the market forged a strong and persistent network of social and economic relationships, supplying one another with food products, goods, and equipment for both household and commercial use. Customers, too, remained devoted to the market’s traditional character and product offerings. As with other curb markets around the country, the relationship between the storekeepers and street vendors ranged from mutual cooperation to occasional hostility over territory, street cleaning, and trash removal. In October 2007 the Pennsylvania Historical and Museums Commission dedicated an historic marker for the “9th Street Curb Market,” in recognition of its mission to counter high food prices and shortages during World War I and for its survival as a place where neighborhood businesses still offer fresh produce and a variety of ethnic specialty foods. By the 1940s commerce on Ninth Street was commonly known as the Italian Market, owing to the dominance of Italian-owned businesses and clientele. Merchandising was, and still is, central to its success. The linear arrangement of contiguous businesses with awnings appended to store fronts offers the public amenity of an uninterrupted covered sidewalk. The awnings, some of which are decorated with bold colorful patterns, not only protect buyers, sellers, and merchandise from the elements, they also create a distinctive and attractive atmosphere where vendors conduct business open-air and year round. The proximity of multiple establishments engaged in the same kind of trade stimulates competition, and several businesses still vie for the title of having invented the Philly cheesesteak in the 1930s, now a nationally recognized street food. 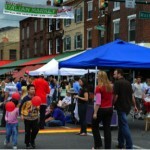 The Italian Market is also a popular destination for other street foods, such as hoagies, pizza, Italian ice, and soft pretzels. After World War II, following the broad pattern of assimilation and dispersion of other ethnic groups in the United States, the character of the Italian Market began to change in several respects. The traditional practice of living above one’s shop disappeared, as subsequent generations dispersed and settled in other parts of the city, the suburbs, or in southern New Jersey. They either commuted to their shops or maintained their market real estate as landlords. The availability of commercial space for rent attracted new immigrant groups as tenants, marking a change in the ethnic composition of merchants. In 1983 the Italian Market introduced its first Korean-owned establishment at 1000 South Ninth Street, and since then a significant number of Vietnamese, Korean, Chinese, and Mexican-run businesses have joined the traditional Italian shops. Some establishments feature their own ethnic cuisines, such as Korean barbeque and Vietnamese Pho (noodle soup), while others cater to local residents with specialty gift shops and services. In 2000 the city Planning Commission certified the South Ninth Street area including the Italian Market as blighted, owing to a high rate of vacant buildings, vacant land, and tax delinquency. 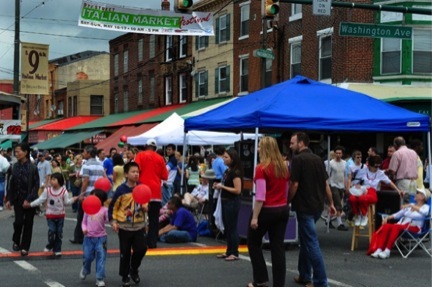 As a result, the Italian Market was slated for redevelopment in 2006, and the city and business community joined in a commercial revitalization initiative to improve sanitation and to rehabilitate the market stalls and awnings. The store fronts were maintained to reflect the individual tastes, trends, and upkeep of the vendors, with varied facades of red brick, yellow brick, faux stone, aluminum siding, and stucco. 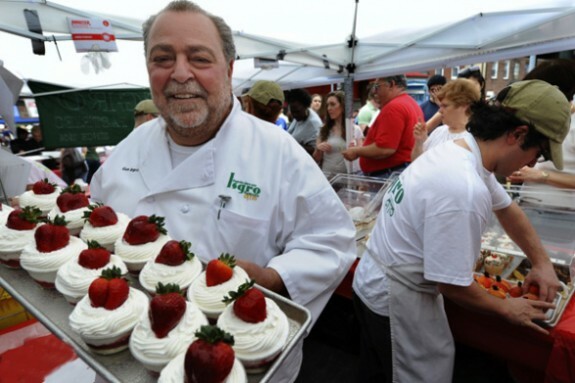 In 2008 the founding families sponsored a historic marker that recognizes the market’s Italian heritage and its dominance as a regional source for Italian food products. The marker not only certified a rich heritage but also reflected the curb market on Ninth Street as a tourist destination, where visitors can experience Philadelphia tastes and history. The Italian Market taps the popularity of outdoor shopping, sidewalk dining, specialty food shops, and ethnic street festivals. Patrons include a varied clientele of local shoppers, gourmet cooks, restaurant suppliers, and tourists, all of whom are attracted to its special product offerings and ambiance. It consistently maintains its integrity as a commercial district with independent but interrelated businesses that share similar merchandising strategies and a common identity as a place dedicated to Philadelphia’s evolving food landscape. Helen Tangires holds a PhD in American studies from The George Washington University. She is a frequent contributor to books and journals on urban foodways and is the author of Public Markets and Civic Culture in Nineteenth-Century America (2003). Dr. Tangires is also the administrator of the Center for Advanced Study in the Visual Arts at the National Gallery of Art in Washington, DC. Aguilera, Francisco Enrique.“The Italian Market: Spatial Nucleus of a Community Within a Metropolis.” M.S. thesis, University of Pennsylvania, 1968. 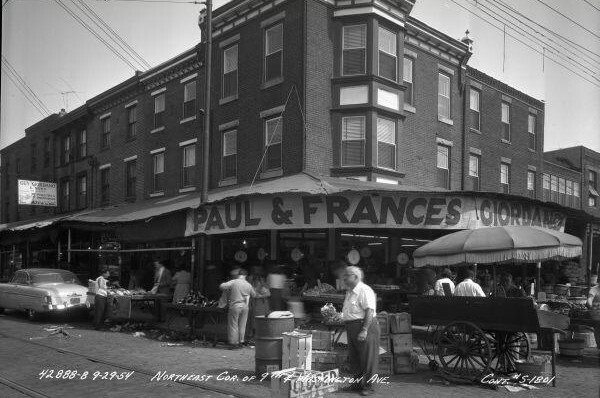 Juliani, Richard N. Building Little Italy: Philadelphia’s Italians Before Mass Migration. University Park: Pennsylvania State University Press, 1998. Monteleone, Simone Elizabeth, “The Italian Market: A Neighborhood Commercial Core,” M.S. thesis, University of Pennsylvania, 1998. Morello, Celeste A. 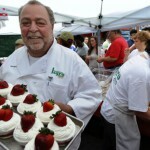 The Philadelphia Italian Market Cookbook: The Tastes of South Ninth Street. Philadelphia: Jefferies and Manz, 1999. Spina, Laura M. 9th & Ellsworth Redevelopment Area Plan, Philadelphia City Planning Commission, September 2006. Taormina, Felicity and Irina Smith. To Market, to Market: Philadelphia’s Italian Market. Philadelphia: Taormina and Smith, 1979. Pennsylvania Historical and Museums Commission (PHMC), Ninth Street Curb Market, Philadelphia, Historic Marker Program Files, 400 North Street, Harrisburg, Pa. Historic Marker, The Italian Market, northwest corner of Ninth and Montrose Streets, Philadelphia. Historic Marker, Ninth Street Curb Market, northeast corner of Ninth and Christian Streets, Philadelphia.